The Bundeskartellamt’s decision on Facebook received a warm welcome by the media in Germany yesterday. Probably, our blog with Justus Haucap’s remarks was the loudest (and most profound) critical voice. Today, Rupprecht Podszun joins in to share his first thoughts on a decision that is definitely a nominee for Innovation of the Year. Dieser Text ist auch auf Deutsch verfügbar. Klicken Sie dazu einfach oben rechts auf die Flagge. The case is based on section 19 of the German competition act, a provision that is basically the German version of Art. 102 TFEU. Interestingly, the Bundeskartellamt does explicitly not base it on Art. 102 TFEU. Why is that? Well, according to the Bundeskartellamt, the German case law is more far-reaching than the European one. Ah, okay… And I had already suspected that this may have to do with Articles 11 and 13 Regulation 1/2003 which would allow the European Commission to have a say in the case. That, of course, did not play any role. I agree, and regarding the behaviour in question the social network aspect of Facebook’s business is the decisive one. Facebook’s dominance, in my view, should not be too controversial, anyway. I take that as a given. 1 There is such a thing as exploitative abuse that is prohibited under abuse of dominance provisions. True, we did not engage in exploitation cases very often in the past, and if we did, we really washed our hands of it afterwards. The cases we did were very peculiar, for example involving collecting societies. Yet, truth is: Abuse by exploitation of customers is in the law, and thus it is okay for an authority to bring a case based on this rule. If you do not believe me, please read Art. 102 lit. a) TFEU. 2 Such an abuse may refer to the terms and conditions applied by a company. This is what the law says. The Facebook case does not deal with excessive pricing, but with excessive data-ing.So, this is even more uncommon than excessive pricing. 3 If you need to prove exploitation you need a benchmark of what is allowed and what is not. At what point do terms and conditions turn into anti-competitive exploitation? German law relies on as-if-competition. Conditions are abusive that “differ from those which would very likely arise if effective competition existed” (Art. 102 TFEU is not even that clear). Looking at comparable markets is the number one option for that, but it is not the only possible way. Had we seen more cases in the past on abusive conditions it would be easier to determine where the red lines are. 4 For establishing an infringement, it is not necessary to have a strict causality of dominance and abuse. Think of the AstraZeneca ruling of the Court of Justice where the pharmaceutical company misled patent authorities. German courts speak of a “normative causality”: It suffices that the behaviour strengthens the position of the dominant company, e.g. by raising market barrier entries. 5 This case has a political dimension since Germany is discussing whether the Bundeskartellamt may also act as a consumer protection authority. All five aspects are unchartered territory for competition lawyers. One and Two make it perfectly legitimate for the Bundeskartellamt to start such a case and look into the use of data. “Really?” I hear my friends from the privacy department saying, “is that Bundeskartellamt a data protection agency in the sense of the GDPR?” I would love to retort as did a case handler from the Bundeskartellamt once. “We would never have started that case, if the data protection agencies had done their job.” From a legal point of view that may be a weak argument. Formally, the Bundeskartellamt does not base its decision on the GDPR, but on competition law. We frequently see cases in which there are overlaps of different fields of the law with competition law, e.g. in energy or IP, with different enforcement regimes. There needs to be some coherence, for sure. The Bundeskartellamt says it “closely cooperated with leading data protection authorities”. Whether the leading ones are the competent ones may be an issue. Yet, if you find a violation of competition law, it would be very awkward if you had to shy away from enforcement since there are other fields of the law that may have to do with your decision. That is the price to pay in a multi-level, multi-rule governance system for a highly complex economy. 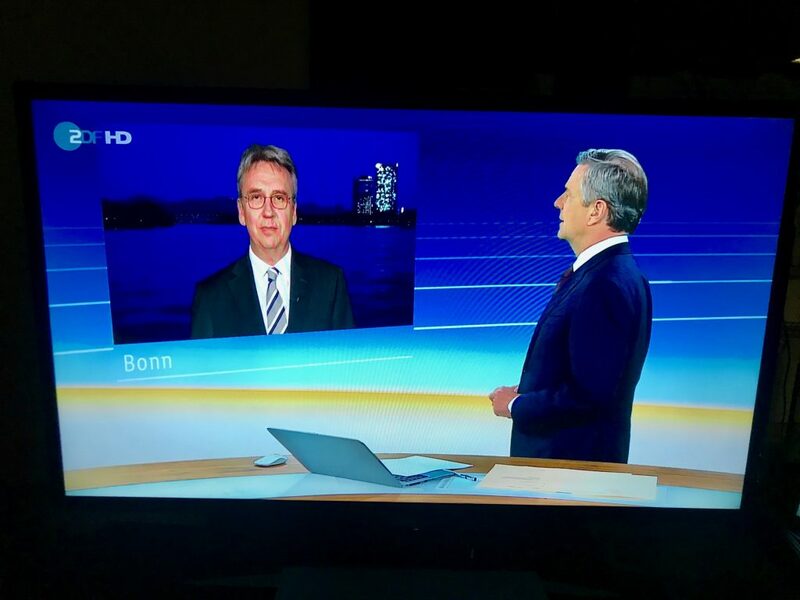 President Andreas Mundt explaining Facebook on TV (this is ZDF’s “heute journal” with anchorman Claus Kleber (right). In my view, the most intriguing question is the one associated with issue Number 3: When does the use of data amount to a violation of competition law? One may read the Bundeskartellamt’s statement as saying: If you are dominant and you violate the law, this is a competition law infringement. Yet, I am pretty sure (and I sincerely hope) that the argument in the written decision is, well, more elaborate. First of all, the violation of the law needs to have a link to competition. The term “abuse” still refers to competition. (If you are German and are familiar with the law on unfair commercial practices, the UWG, you may think of section 3a UWG as a minimum requirement here.) This, however, is beyond doubt in this case: Facebook’s collection and handling of data certainly has a competitive angle to it. This is what the business model is based on. The vast amount of data and data integration gives Facebook leverage for the downstream market of advertising. Data is the essential input for the market success of a social network. We cannot ignore the use of core parameters as an essential competitive aspect. Okay, if we accept that (a) data is an essential competitive parameter, and (b) there may be exploitation through forcing users to agree to terms and conditions that are “excessive”, the question remains: Where does the excess start? I would first try to find a comparable market that is competitive. Now, if you look around, you may see some infringements of privacy rules in parts of the online world that are not yet monopolised by one strong company. But markets need to be “comparable”. If my knitted elephant dealer violates GDPR rules when I visit her website, this is not comparable. Others do it? That’s not good. But they are not Facebook, and they are not the strongest social network in the world with access to a mass of the most personal information. If Facebook complains (as it does) that “the Bundeskartellamt is trying to implement an unconventional standard for a single company”, we should keep in mind that this single company is not just your local dealer from around the corner who happens to know where you live. Google may be comparable. But it is not really the prime example for a player in a competitive environment. So, no comparable competitive markets. And we are still trying to determine what is excessive. I find it plausible to say that the minimum request for someone with a “special responsibility” (and that is what European law says about dominant companies) is to obey the law. If there are legal principles that aim to protect a negotiating party in an imbalanced negotiation position, the ignorance of these principles amounts to an abuse. The Bundeskartellamt refers to two cases from German case law: Pechstein was the case of the famous ice skater who fought the verdict of the sports arbitration court relying on antitrust law (unsuccessfully in the end). VBL Gegenwert is a complex case where the terms and conditions of a pension rights adjustment contract were at stake. In both cases, the courts were confronted with situations of an economic imbalance due to unfavourable contracts. They tried to establish a more competitive constellation with market actors that meet in a level playing field. Now with the GDPR and other rules (constitutional rights may play a role) serving as a benchmark we find the same thing: Consumers are placed in a better position in their arm-wrestling exercise with the dominant provider. The consumer’s bargaining power is promoted to another level. That looks like a very structural approach to me: An exploitation case that is actually pushing consumers into a better negotiating position vis-à-vis the dominant company. That is not pure consumer protection as in excessive pricing cases. This is not even data protection as in privacy cases. This is about the market power of different market actors. From the Bundeskartellamt’s press release, we do not learn a lot about the infringements of privacy rules that are at issue here. Probably, there will be some controversy on this, too. I need to point out that the standard applied in this case is not necessarily identical with the GDPR since we are looking at it from a competition law angle, and possibly other rules play a role (constitutional law!). So consent needs to be voluntary and needs to be more than just the ordinary ticking away. That probably gives the parties a lot of room for haggling when implementation is due. It seems that the Bundeskartellamt really wants choice for consumers when agreeing to terms and conditions. Let’s see whether the Bundeskartellamt finally kills the unnerving exercise of ticking this box and that box and gives that process some meaning. The interface of privacy and competition is an intricate one. Competition lawyers see data as a competitive parameter, not as a substantial personal right of the individual. Maybe this is even a stunning twist: We know the privacy paradox: Users often do not care when revealing, well, everything to that digital interface. They may be more aware of their privacy when noticing the economic or bargaining value of data. It is not the “loss of control” (as mentioned in the Office’s press release) that should concern competition agencies so much, but the loss of bargaining power. That said, and going back for a second to the issue of comparable markets, you may keep in mind that there probably is no comparable competitive market at all: At present, companies do not compete on privacy of their customers (but for a few instant messengers such as Signal and Threema). They compete on things like fancy-shmancy interfaces and phoney-baloney emojis. I find it hard to employ the concept of comparable competitive markets to a competitive asset that is completely undervalued by those having it. You may argue that under such circumstances competitive protection is not necessary. Yet, this is not the approach of exploitation cases, and it ignores the competitive impact on downstream markets. People keep asking: What is the theory of harm to competition? Again, I think, this is a misunderstanding. Stopping the exploitation of customers is not necessarily involving stopping harm to our idea of competition. I still tried to make the case (above) that this is about competition or at least about bargaining power of consumers vis-à-vis a dominant player. But please do not forget that we argue on the basis that it is legitimate to simply protect consumers from being exploited. The competition element comes in with the fourth element, causation. As stated earlier, German courts are happy to accept a milder form of causation, namely a “normative causality”. If the unlawful behaviour strengthens the position of the dominant company, e.g. by reinforcing entry barriers, this shall suffice. And indeed: the integration of ever more data puts Facebook into an ever stronger position. According to the standards from past cases, this should not be a big thing for the courts to accept. And so, the Bundeskartellamt’s team (led by Julia Topel, btw) concludes that Facebook needs to refrain from integrating Instagram- and WhatsApp-data with the user profiles from Facebook (this is called an “internal divestiture”, funny term!) and may also not integrate other data from third party websites with the Facebook user profile without voluntary consent. Put differently: The social network service called Facebook shall run on its own data only and on those that the user voluntarily agrees to bring in. This is merger control the 102-way (do not use data of companies you acquired), and it is a step forward to making data count as a competitive parameter. If the Bundeskartellamt’s definition of “voluntary” is different from just ticking the box, this may ultimately make users aware that they are trading away something of value for some glass beads. I have not yet written a word on the political dimension of the case. But these were supposed to be first thoughts, so I stop here. It’s a fascinating case. It is more about law than about economics, I think. The Bundeskartellamt is pioneering with this case, and obviously it is more pro-enforcement than others – in particular the data protection authorities or US American antitrust lawyers. Is it courageous? Not in the real sense of “courage”. There is a powerful company, and there is a competition agency. That’s not about courage, that’s simply what competition law is all about, all the time. If this is about consumer “exploitation”, wouldn’t that be the remit of consumer or data protection laws, not about exploitative abuse of dominance rules? Where’s the business relationship between the consumer and FB that justifies the facts of this case being shoehorned into Art 102 (or its German equivalent)? Seems pretty misguided to me that the FCO apparently thinks that consumer affairs can now be appraised as an abuse under competition rules if undertaken by a dominant firm. Thank you Rupert: very interesting. I look forward to reading the decision and the reasoning of the BKA. To my mind Continental Can v Commission is key here: one argument in that case was that Article 102 applied ONLY to exploitative abuses and not to exclusionary ones! And also that there was no abuse as C Can had not USED its market power. C Can lost on both of these grounds. Does this not assist the BKa considerably? vielen Dank für Ihren – wie immer – vielschichtigen und humorvollen Beitrag. Mir ist aufgefallen, dass sich am Ende Ihres Blogs Icons verschiedener sozialer Netzwerke finden. Facebook wüsste also jetzt auch, dass ich ein begeisterter Leser Ihres D’Kart Blogs bin – wenn ich denn ein Facebook-Nutzer wäre. Übrigens habe ich gerade mal die Datenschutzerklärung des Blogs durchgelesen – puuuuh, echt lang. Aber ist sie auch vollständig? Müsste sie darüber aufklären, dass Nutzerdaten an Facebook und andere soziale Netzwerke weitergegeben werden? Na egal – gut, dass ich Kartellrechtler bin und kein Datenschutzrechtler! A propos Kartellrecht: Ist D’Kart reine Meinungsäußerung oder aufgrund eines gewissen Werbeeffekts vielleicht doch Teilnahme am Wirtschaftsleben? Gibt es vielleicht einen separaten Markt für Kartellrechts-Blogs? Ist D’Kart schon marktbeherrschend und müsste daher den Nutzern erlauben, durch Setzen eines Häkchens der Weitergabe ihrer Daten an soziale Netzwerke zu widersprechen? Mit diesem Plugin können Social-Media-Buttons eingebunden werden, ohne dass diese selbstständig Daten übermitteln. Erst wenn der Nutzende aktiv auf den jeweiligen Button klickt, stellt Shariff eine Verbindung mit dem sozialen Medium her. Facebook argues they compete with all companies that strive for users’ attention and thus belong to the same market as these companies. Other companies strive for their customers’ money. Do they belong to the same market as all other companies which do so? Wieder ein sehr interessant zu lesender Artikel. Zwei Gedanken dazu: 1. ansatzweise vergleichbarer Markt: E-Mail-Anbieter. Hier gibt es doch eine Ausdifferenzierung nach Datenschutz: Während ich als Privatnutzer bei Google-Mail wenig bis gar keinen Datenschutz erwarte/bekomme, gibt es andere Anbieter, die mit hohem Datenschutz werben (Posteo, Mailbox). Bei Geschäftskunden dürfte die Ausdifferenzierung noch weitaus größer sein. 2. Ich finde das, von Facebook vorgebrachte, Argument, man sei auf einem Markt um Aufmerksamkeit (wie Haucap in dem anderen Beitrag zu diesem Thema schreibt) hoch problematisch da nicht anwendbar. Wenn dieses Konzept angewendet würde, müsste mE auch das Kreuzworträtsel aus der Tageszeitung als Wettbewerber von Facebook betrachtet werden. Ich für meinen Teil widmen nämlich beidem gerne ab und zu meine Aufmerksamkeit. Wie sehen sie das, Herr Haucap? Rechtswissenschaftler machen es sich doch häufig leicht den Sinn und Zweck eines Vorgehens weitgehend auszuklammern. Wenn eine Kartellbehörde fremdes Recht anwendet, um kartellrechtlichen Missbrauch nachzuweisen, dann sollte es vielleicht doch etwas mit Wettbewerb zu tun haben. Und das Konzept der normativen Kausalität (übrigens in Deutschland längst nicht etabliert wie in Europa) verlangt das auch, Herr Podszun. Ja der Marktbeherrscher unterliegt besonderen Auflagen. Aber auch das hat den Sinn den Wettbewerb zu schützen. 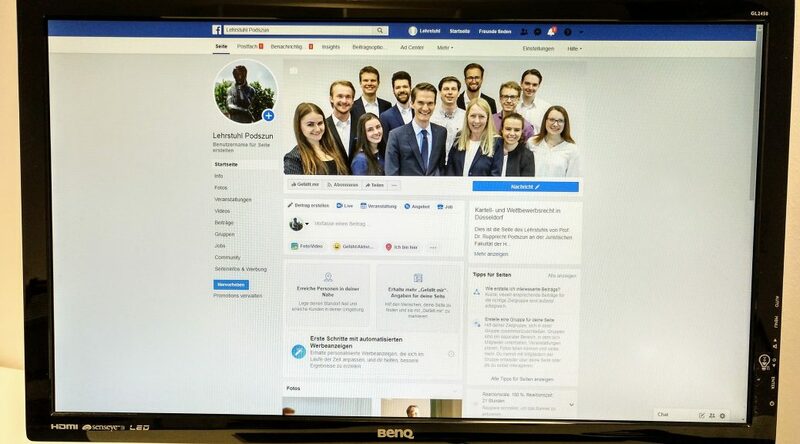 Kommt Facebooks Marktstellung aber daher das sie Daten verknüpfen, wie das Kartellamt mit einem riesigen Aufwand ermittelt hat? Wer das meint, der hat wohl noch nie von Netzeffekten gehört.